In its search for the reason behind last month's explosion that destroyed its Falcon 9 rocket, SpaceX has vowed to leave no stone unturned. Now one of its staffers may be taking things a little too far. The doomed Falcon 9 suffered a catastrophic failure while being fueled for a static firing test. It is believed a failure in the liquid oxygen fuel system caused the blast. But three industry officials with knowledge of the episode told The Washington Post that foul play has also been mooted as a possible cause. Someone at SpaceX reported that the video of the explosion appeared to show an oddly moving shadow and a white flash on the roof of a building a mile away seconds before the explosion. The twist is that the building is owned and operated by the United Launch Alliance (ULA) – SpaceX's bitter rival in the orbital launch market. Sources whisper that a SpaceX representative went around to the building and asked to inspect the roof in a "cordial, not accusatory, encounter." ULA turned them down. SpaceX then called in Air Force investigators to take a look at the rooftop and nothing suspicious was found. 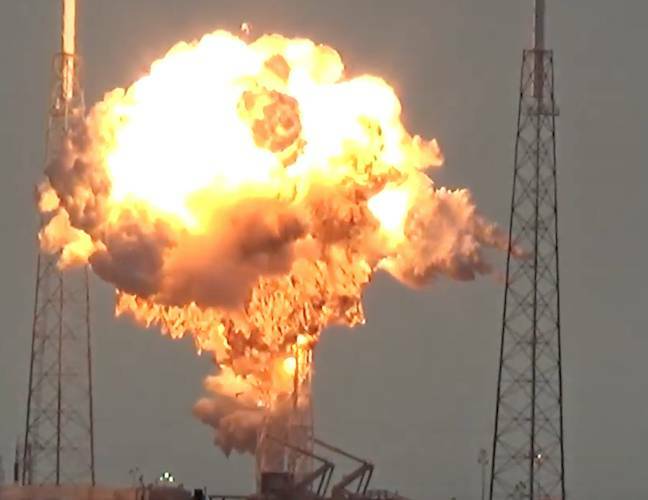 The ULA would like nothing better than to see SpaceX's business crash and burn. Elon's Musketeers smashed apart the ULA's cozy monopoly for US military launches and forced it to compete on price, something the alliance has great difficulty doing with its current rocket system. But it's stretching the bounds of credulity to think that people within ULA hatched a cunning plan to take their rival out of the game by shooting up its rockets on the pad – from the roof of its own business to boot. It would be a hugely risky move that would see executives jailed, if proved, and the risks far outweigh the reward. There are also practical problems. The ULA building is a touch over one mile from SpaceX's launch pad, and that makes it a very long shot indeed. The world record sniping shot is 2,475 meters (1.54 miles). Anyone looking to take a potshot at the Falcon would have to take into account the wind speed, humidity, and then hit the rocket at precisely the right spot to make it look like an accident. While it's technically just possible, Occam's razor would suggest that there is a more prosaic explanation for why the Falcon (and Facebook's internet satellite) went boom last month. But that's not going to stop the conspiracy theorists going nuts on this one for a while. "We’ve eliminated all of the obvious possibilities for what occurred there," SpaceX supremo Elon Musk said at a conference in Mexico last week. "So what remains are the less probable answers," he added without expanding further. Musk said figuring out the cause of the explosion is an "absolute top priority" for his boffins.